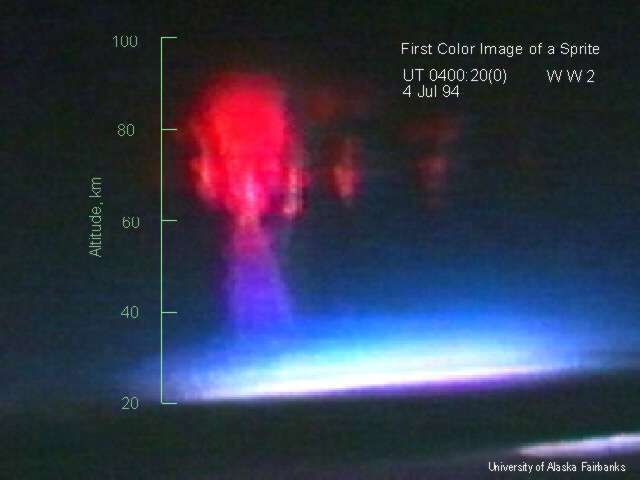 Red sprites and blue jets are recently discovered atmospheric phenomenon. They were first discovered in 1989 by accident while using low light level television from the space craft. Red sprites are considered to be weak luminous flashes that occur above an electrically active thunderstorm as seen below in this photo courtesy of the University of Alaska Fairbanks. These sprites extend to around 95 km into the atmosphere. Sprites usually don't occur alone, but in groups of two or three. The duration of sprites is only a few milliseconds. Studies currently indicate that sprites typically occur in the decaying portions of thunderstorms and are correlated with positive cloud to ground lightning strokes as shown below. The strength of a sprite is comparable to a moderately bright auroral. 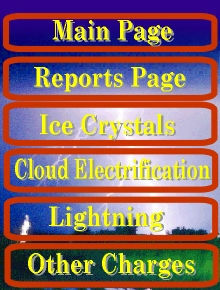 Like red sprites, blue jets can only be captured on low light television systems. Because of this, they were only discovered recently as well. Blue jets are found over the core of electrically active thunderstorms. When they exit the tops of thunderstorms, they travel around 100m/s and disappear around 40-50 km. 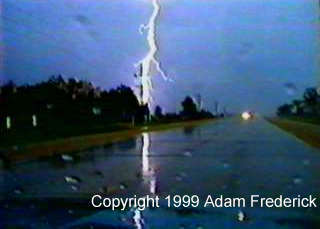 A new type of lightning phenomena has recently been discovered by Niagara Mohawk is currently being researched. This type of phenomena occurs with power lines. In this process, it is theorized that a leader starts draw power off of the power poles. As seen in the pictures below, a little flash of energy in the middle of the power line, thought now to be energy being drawn by the leader. 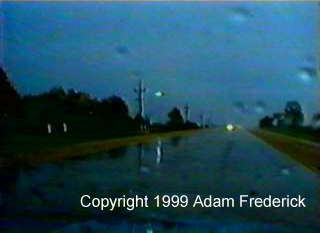 In the next frame, a bolt of lightning is seen with a finger extending to the point where the flash was seen on the power line.